Catch All 13 Episodes from Season 5 Plus Over 3 Hours of Never-Before-Seen Bonus Features, Including 6 All-New Featurettes, 2 Full-Length Commentaries, Deleted Scenes, Gag Reel, and an Extended Version of the Series Finale Episode! BURBANK, CA (February 1, 2012) - It's no secret that all good things must come to an end. The final season of this fan-favorite series will be available on Blu-ray Hi-Def and DVD on May 8, 2012 from Warner Home Video. 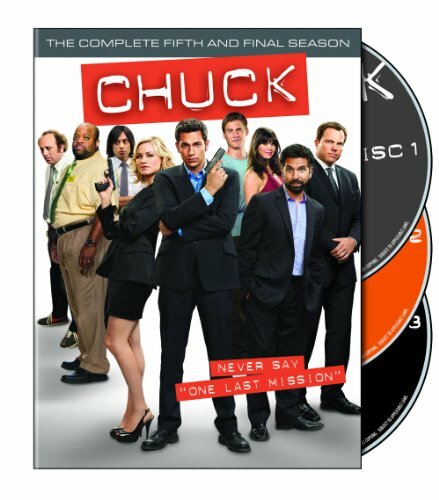 Chuck: The Complete Fifth and Final Season includes all 13 episodes from Season Five plus over 3 hours of never-before-seen bonus features, including six brand-new featurettes, two full-length commentaries, deleted scenes, gag reel, and an extended version of the series finale episode. The Blu-ray will be released in 1080p Full HD Video and will feature DTS-HD Master Audio for English 5.1. Chuck: The Complete Fifth Season is priced to own at $39.98 SRP on DVD and $49.99 SRP on Blu-ray. In the fifth and final season, Chuck is ready to take Operation Bartowski freelance. Chuck's spy abilities will be put to a new test when he and his team must save mankind without the help of the CIA. Instead, they'll use the cover of the Buy More electronics store to fund their own operations, leading to new missions, new stakes and new obstacles. With Chuck and Sarah as newlyweds and his family in on his secret, it has never been harder for Chuck to separate his spy life from his personal life. "During its run, Chuck had an incredibly loyal fan base," said Rosemary Markson, WHV Vice President, TV and Special Interest Marketing. "Fans actively worked to save this unique show from cancellation by creating a talked-about 'Save Chuck' campaign, helping the show stay on air for five very entertaining seasons. We are very excited to release the final installment of the series on DVD and Blu-ray." Chuck co-creator/executive producer Chris Fedak added: "Five years ago, Josh and I set out to tell an action-adventure story about a regular guy's quarter life crisis. We've been able to do so much more. This final season is a love letter to everything we've done. We hope fans enjoy it as much as we enjoyed making it." *Limited Time Offer. Restrictions and Limitations apply. Does not include iTunes Digital Copy file. Go to ultraviolet.flixster.com/info for details. Chuck is co-created by Josh Schwartz ("The O.C.," "Gossip Girl," "Hart of Dixie") and Chris Fedak, and is executive produced by Schwartz, McG ("Supernatural," "Nikita," "Charlie's Angels," "Terminator Salvation"), Fedak, Robert Duncan McNeill ("What About Brian," "V," "The O.C. "), and Nicholas Wootton ("NYPD Blue," "Law & Order," "Prison Break"). Chuck is produced by Fake Empire, Wonderland Sound and Vision in association with Warner Bros. Television. With operations in 90 international territories, Warner Home Video, a Warner Bros. Entertainment Company, a division of the Warner Bros. Home Entertainment Group, commands the largest distribution infrastructure in the global video marketplace. Warner Home Video's film library is the largest of any studio, offering top quality new and vintage titles from the repertoires of Warner Bros. Pictures, Turner Entertainment, Castle Rock Entertainment, HBO Home Video and New Line Home Entertainment. Artwork is downloadable at www.WHVDirect.com or by request.